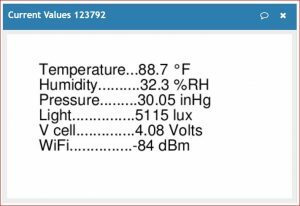 Here is a selection of MATLAB Visualizations for ThingSpeak addins that may be used with the IoT Kits to display the weather data in different formats. Display current values in a text box. The values do not align well because the font is proportional. This uses ThingSpeakPlotYY to have different left and right axes. 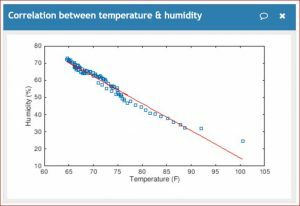 Temperature and Dew Point are plotted using the left axis. 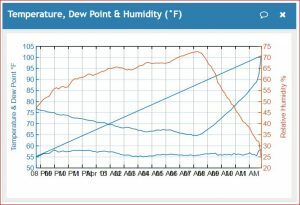 There does not appear to be an easy way to have multiple series for each axis so dew point and temperature are plotted in the same color and there is a spurious line connecting the last data point of temperature to the first data point of dew point. % Script expects temperature in °C. It then calculates dewpoint in °C. % Calculated temperatures are converted to °F for charting. % before doing the dewpoint calculation. % Specify the constants for water vapor (b) and barometric (c) pressure. % going to the Documentation tab on the right side pane of this page.